False-colored SEM of mouse veins. The circulatory system transports 5 liters of blood in and out of the human heart through massive vessels and tiny capillaries. One study in the current issue looks in depth at how matrix Gla protein can control the development of the vasculature in an organ-specific manner (page 2993). Bazigou and colleagues also present data in this issue to identify the molecular regulators of venous valve development (page 2984). Citation Information: J Clin Invest. 2011;121(8):2947-2947. https://doi.org/10.1172/JCI59193. Citation Information: J Clin Invest. 2011;121(8):2949-2951. https://doi.org/10.1172/JCI59319. Citation Information: J Clin Invest. 2011;121(8):2952-2952. https://doi.org/10.1172/JCI59886. Citation Information: J Clin Invest. 2011;121(8):2953-2953. https://doi.org/10.1172/JCI57214. Citation Information: J Clin Invest. 2011;121(8):2954-2954. https://doi.org/10.1172/JCI57171. Citation Information: J Clin Invest. 2011;121(8):2955-2968. https://doi.org/10.1172/JCI46315. Atrial fibrillation (AF) is an extremely common cardiac rhythm disorder that causes substantial morbidity and contributes to mortality. The mechanisms underlying AF are complex, involving both increased spontaneous ectopic firing of atrial cells and impulse reentry through atrial tissue. Over the past ten years, there has been enormous progress in understanding the underlying molecular pathobiology. This article reviews the basic mechanisms and molecular processes causing AF. We discuss the ways in which cardiac disease states, extracardiac factors, and abnormal genetic control lead to the arrhythmia. We conclude with a discussion of the potential therapeutic implications that might arise from an improved mechanistic understanding. Was Feuerbach right: are we what we eat? Citation Information: J Clin Invest. 2011;121(8):2969-2971. https://doi.org/10.1172/JCI58595. Food and stress are powerful modulators of the body-mind connection, which is imbalanced in obese individuals. Why do we choose chocolate over an apple when overworked and stressed, and why does comfort food make us feel better? Two independent studies in the JCI, one in this issue, home in on the role of stress on gut hormones and food choices and, conversely, on the effect of the intestinal system on modulation of brain activity by sadness. These studies broaden our understanding of the ties between food and mood and underscore promising targets for obesity treatments. Citation Information: J Clin Invest. 2011;121(8):2972-2975. https://doi.org/10.1172/JCI59190. The heat shock response (HSR) is a highly conserved protective mechanism that enables cells to withstand diverse environmental stressors that disrupt protein homeostasis (proteostasis) and promote protein misfolding. It has been suggested that small-molecule drugs that elicit the HSR by activating the transcription factor heat shock factor 1 might help mitigate protein misfolding and aggregation in several devastating neurodegenerative disorders, including Huntington disease (HD). In this issue of the JCI, Labbadia et al. use a brain-penetrant Hsp90 inhibitor, HSP990, to induce the HSR in mouse models of HD. Unexpectedly, they observed that HSP990 confers only transient amelioration of a subset of HD-related phenotypes, because alterations in chromatin architecture impair the HSR upon disease progression. These findings suggest that synergistic combination therapies that simultaneously unleash the HSR and prevent its impairment are likely to be needed to restore proteostasis in HD. Oxidized CaMKII: a “heart stopper” for the sinus node? Citation Information: J Clin Invest. 2011;121(8):2975-2977. https://doi.org/10.1172/JCI58389. Each normal heart beat is triggered by an electrical impulse emitted from a group of specialized cardiomyocytes that together form the sinoatrial node (SAN). In this issue of the JCI, Swaminathan and colleagues demonstrate a new molecular mechanism that can disrupt the normal beating of the heart: angiotensin II — typically found in increased levels in heart failure and hypertension — oxidizes and activates Ca2+/calmodulin-dependent kinase II via NADPH oxidase activation, causing SAN cell death. The loss of SAN cells produces an electrical imbalance termed the “source-sink mismatch,” which may contribute to the SAN dysfunction that affects millions of people later in life and complicates a number of heart diseases. Citation Information: J Clin Invest. 2011;121(8):2978-2981. https://doi.org/10.1172/JCI58752. Spinal muscular atrophy (SMA) is an autosomal recessive neurodegenerative disease that predominantly affects motor neurons, resulting in progressive muscular atrophy and weakness. SMA arises due to insufficient survival motor neuron (SMN) protein levels as a result of homozygous disruption of the SMN1 gene. SMN upregulation is a promising and potent treatment strategy for this currently incurable condition. In this issue of the JCI, two independent research groups report novel observations in mouse models of severe SMA that provide hope that this approach will afford meaningful benefit to individuals with SMA. Citation Information: J Clin Invest. 2011;121(8):2981-2983. https://doi.org/10.1172/JCI58406. The burden of disease during seasonal influenza epidemics is felt most keenly among the very young and the elderly. Although vaccination effectively protects children and young adults against infection, it has limited efficacy in elderly individuals. This has been linked to a reduced ability to induce a robust serum antibody response. 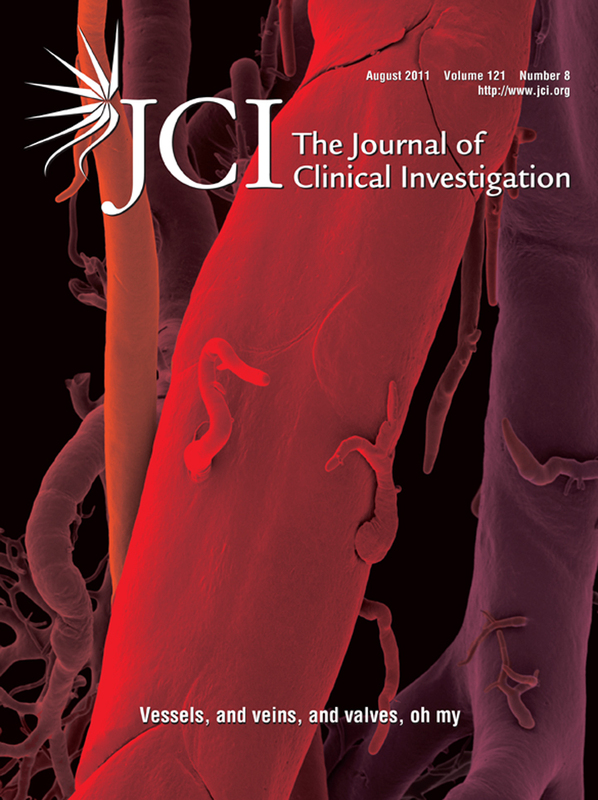 In this issue of the JCI, Sasaki et al. identify some of the cellular and molecular deficits that underlie the reduced serum antibody response induced by influenza vaccination in elderly individuals. Importantly, they show that it is the quantity of the response, and not its quality, that needs to be improved if we are to enhance the success of influenza vaccination in this vulnerable population. Citation Information: J Clin Invest. 2011;121(8):2984-2992. https://doi.org/10.1172/JCI58050. Chronic venous disease and venous hypertension are common consequences of valve insufficiency, yet the molecular mechanisms regulating the formation and maintenance of venous valves have not been studied. Here, we provide what we believe to be the first description of venous valve morphogenesis and identify signaling pathways required for the process. The initial stages of valve development were found to involve induction of ephrin-B2, a key marker of arterial identity, by venous endothelial cells. Intriguingly, developing and mature venous valves also expressed a repertoire of proteins, including prospero-related homeobox 1 (Prox1), Vegfr3, and integrin-α9, previously characterized as specific and critical regulators of lymphangiogenesis. Using global and venous valve–selective knockout mice, we further demonstrate the requirement of ephrin-B2 and integrin-α9 signaling for the development and maintenance of venous valves. Our findings therefore identified molecular regulators of venous valve development and maintenance and highlighted the involvement of common morphogenetic processes and signaling pathways in controlling valve formation in veins and lymphatic vessels. Unexpectedly, we found that venous valve endothelial cells closely resemble lymphatic (valve) endothelia at the molecular level, suggesting plasticity in the ability of a terminally differentiated endothelial cell to take on a different phenotypic identity. Citation Information: J Clin Invest. 2011;121(8):2993-3004. https://doi.org/10.1172/JCI57567. Arteriovenous malformations (AVMs) in organs, such as the lungs, intestine, and brain, are characteristic of hereditary hemorrhagic telangiectasia (HHT), a disease caused by mutations in activin-like kinase receptor 1 (ALK1), which is an essential receptor in angiogenesis, or endoglin. Matrix Gla protein (MGP) is an antagonist of BMPs that is highly expressed in lungs and kidneys and is regulated by ALK1. The objective of this study was to determine the role of MGP in the vasculature of the lungs and kidneys. We found that Mgp gene deletion in mice caused striking AVMs in lungs and kidneys, where overall small organ size contrasted with greatly increased vascularization. Mechanistically, MGP deficiency increased BMP activity in lungs. In cultured lung epithelial cells, BMP-4 induced VEGF expression through induction of ALK1, ALK2, and ALK5. The VEGF secretion induced by BMP-4 in Mgp–/– epithelial cells stimulated proliferation of ECs. However, BMP-4 inhibited proliferation of lung epithelial cells, consistent with the increase in pulmonary vasculature at the expense of lung tissue in the Mgp-null mice. Similarly, BMP signaling and VEGF expression were increased in Mgp–/– mouse kidneys. We therefore conclude that Mgp gene deletion is what we believe to be a previously unidentified cause of AVMs. Because lack of MGP also causes arterial calcification, our findings demonstrate that the same gene defect has drastically different effects on distinct vascular beds. Citation Information: J Clin Invest. 2011;121(8):3005-3023. https://doi.org/10.1172/JCI46358. Stroke is the leading cause of long-term disability and the third leading cause of death in the United States. While most research thus far has focused on acute stroke treatment and neuroprotection, the exploitation of endogenous brain self-repair mechanisms may also yield therapeutic strategies. Here, we describe a distinct type of stroke treatment, the naturally occurring extracellular matrix fragment of perlecan, domain V, which we found had neuroprotective properties and enhanced post-stroke angiogenesis, a key component of brain repair, in rodent models of stroke. In both rat and mouse models, Western blot analysis revealed elevated levels of perlecan domain V. When systemically administered 24 hours after stroke, domain V was well tolerated, reached infarct and peri-infarct brain vasculature, and restored stroke-affected motor function to baseline pre-stroke levels in these multiple stroke models in both mice and rats. Post-stroke domain V administration increased VEGF levels via a mechanism involving brain endothelial cell α5β1 integrin, and the subsequent neuroprotective and angiogenic actions of domain V were in turn mediated via VEGFR. These results suggest that perlecan domain V represents a promising approach for stroke treatment. Citation Information: J Clin Invest. 2011;121(8):3024-3028. https://doi.org/10.1172/JCI43048. Type 1 diabetes is characterized by destruction of insulin-producing β cells in the pancreatic islets by effector T cells. Tregs, defined by the markers CD4 and FoxP3, regulate immune responses by suppressing effector T cells and are recruited to sites of action by the chemokine CCL22. Here, we demonstrate that production of CCL22 in islets after intrapancreatic duct injection of double-stranded adeno-associated virus encoding CCL22 recruits endogenous Tregs to the islets and confers long-term protection from autoimmune diabetes in NOD mice. In addition, adenoviral expression of CCL22 in syngeneic islet transplants in diabetic NOD recipients prevented β cell destruction by autoreactive T cells and thereby delayed recurrence of diabetes. CCL22 expression increased the frequency of Tregs, produced higher levels of TGF-β in the CD4+ T cell population near islets, and decreased the frequency of circulating autoreactive CD8+ T cells and CD8+ IFN-γ–producing T cells. The protective effect of CCL22 was abrogated by depletion of Tregs with a CD25-specific antibody. Our results indicate that islet expression of CCL22 recruits Tregs and attenuates autoimmune destruction of β cells. CCL22-mediated recruitment of Tregs to islets may be a novel therapeutic strategy for type 1 diabetes. Citation Information: J Clin Invest. 2011;121(8):3029-3041. https://doi.org/10.1172/JCI57291. Spinal muscular atrophy (SMA) is a common neuromuscular disorder in humans. In fact, it is the most frequently inherited cause of infant mortality, being the result of mutations in the survival of motor neuron 1 (SMN1) gene that reduce levels of SMN protein. Restoring levels of SMN protein in individuals with SMA is perceived to be a viable therapeutic option, but the efficacy of such a strategy once symptoms are apparent has not been determined. We have generated mice harboring an inducible Smn rescue allele and used them in a model of SMA to investigate the effects of turning on SMN expression at different time points during the course of the disease. Restoring SMN protein even after disease onset was sufficient to reverse neuromuscular pathology and effect robust rescue of the SMA phenotype. Importantly, our findings also indicated that there was a therapeutic window of opportunity from P4 through P8 defined by the extent of neuromuscular synapse pathology and the ability of motor neurons to respond to SMN induction, following which restoration of the protein to the organism failed to produce therapeutic benefit. Nevertheless, our results suggest that even in severe SMA, timely reinstatement of the SMN protein may halt the progression of the disease and serve as an effective postsymptomatic treatment. Citation Information: J Clin Invest. 2011;121(8):3042-3050. https://doi.org/10.1172/JCI46276. Spinal muscular atrophy (SMA) is an autosomal recessive neurodegenerative disease that is characterized by the loss of motor neurons, resulting in progressive muscle atrophy. It is caused by the loss of functional survival motor neuron (SMN) protein due to mutations or deletion in the SMN1 gene. A potential treatment strategy for SMA is to upregulate levels of SMN protein. Several agents that activate STAT5 in human and mouse cell lines enhance SMN expression from the SMN2 gene and can compensate, at least in part, for the loss of production of a functional protein from SMN1. Here, we have shown that prolactin (PRL) increases SMN levels via activation of the STAT5 pathway. PRL increased SMN mRNA and protein levels in cultured human and mouse neuronal cells. Administration of STAT5-specific siRNA blocked the effects of PRL, indicating that the PRL-induced transcriptional upregulation of the SMN-encoding gene was mediated by activation of STAT5. Furthermore, systemic administration of PRL to WT mice induced SMN expression in the brain and spinal cord. Critically, PRL treatment increased SMN levels, improved motor function, and enhanced survival in a mouse model of severe SMA. Our results confirm earlier work suggesting STAT5 pathway activators as potential therapeutic compounds for the treatment of SMA and identify PRL as one such promising agent. Citation Information: J Clin Invest. 2011;121(8):3051-3061. https://doi.org/10.1172/JCI44262. Citation Information: J Clin Invest. 2011;121(8):3062-3071. https://doi.org/10.1172/JCI45504. Atherosclerotic cardiovascular disease (ASCVD) affects more than 1 in 3 American adults. Hypercholesterolemia is a major treatable risk factor for ASCVD, yet many individuals fail to reach target levels of LDL-cholesterol (LDL-C) through the use of statins and lifestyle changes. The E3 ubiquitin ligase myosin regulatory light chain–interacting protein (MYLIP; also known as IDOL) is a recently identified regulator of the LDL receptor (LDLR) pathway. Genome-wide association studies (GWASs) in populations of mixed European descent have identified noncoding variants in the MYLIP region as being associated with LDL-C levels, but no underlying functional variants were pinpointed. In order to fine-map actual susceptibility variants, we studied a population demographically distinct from the discovery population to ensure a different pattern of linkage disequilibrium. Our analysis revealed that in a Mexican population, the nonsynonymous SNP rs9370867, which encodes the N342S amino acid substitution, is an underlying functional variant that was associated with high total cholesterol and accounted for one of the previous significant GWAS signals. Functional characterization showed that the Asn-encoding allele was associated with more potent LDLR degradation and decreased LDL uptake. Mutagenesis of residue 342 failed to affect intrinsic MYLIP E3 ligase activity, but it was critical for LDLR targeting. Our findings suggest that modulation of MYLIP activity can affect LDL-C levels and that pharmacologic inhibition of MYLIP activity might be a useful strategy in the treatment of dyslipidemia and ASCVD. Citation Information: J Clin Invest. 2011;121(8):3072-3087. https://doi.org/10.1172/JCI43824. Autosomal recessive primary microcephaly (MCPH) is a genetic disorder that causes a reduction of cortical outgrowth without severe interference with cortical patterning. It is associated with mutations in a number of genes encoding protein involved in mitotic spindle formation and centrosomal activities or cell cycle control. We have shown previously that blocking vasoactive intestinal peptide (VIP) during gestation in mice by using a VIP antagonist (VA) results in microcephaly. Here, we have shown that the cortical abnormalities caused by prenatal VA administration mimic the phenotype described in MCPH patients and that VIP blockade during neurogenesis specifically disrupts Mcph1 signaling. VA administration reduced neuroepithelial progenitor proliferation by increasing cell cycle length and promoting cell cycle exit and premature neuronal differentiation. Quantitative RT-PCR and Western blot showed that VA downregulated Mcph1. Inhibition of Mcph1 expression led to downregulation of Chk1 and reduction of Chk1 kinase activity. The inhibition of Mcph1 and Chk1 affected the expression of a specific subset of cell cycle–controlling genes and turned off neural stem cell proliferation in neurospheres. Furthermore, in vitro silencing of either Mcph1 or Chk1 in neurospheres mimicked VA-induced inhibition of cell proliferation. These results demonstrate that VIP blockade induces microcephaly through Mcph1 signaling and suggest that VIP/Mcph1/Chk1 signaling is key for normal cortical development. Citation Information: J Clin Invest. 2011;121(8):3088-3093. https://doi.org/10.1172/JCI45041. Atopic asthma is a chronic disease of the airways that has taken on epidemic proportions in the industrialized world. The increase in asthma rates has been linked epidemiologically to the rapid disappearance of Helicobacter pylori, a bacterial pathogen that persistently colonizes the human stomach, from Western societies. In this study, we have utilized mouse models of allergic airway disease induced by ovalbumin or house dust mite allergen to experimentally examine a possible inverse correlation between H. pylori and asthma. H. pylori infection efficiently protected mice from airway hyperresponsiveness, tissue inflammation, and goblet cell metaplasia, which are hallmarks of asthma, and prevented allergen-induced pulmonary and bronchoalveolar infiltration with eosinophils, Th2 cells, and Th17 cells. Protection against asthma was most robust in mice infected neonatally and was abrogated by antibiotic eradication of H. pylori. Asthma protection was further associated with impaired maturation of lung-infiltrating dendritic cells and the accumulation of highly suppressive Tregs in the lungs. Systemic Treg depletion abolished asthma protection; conversely, the adoptive transfer of purified Treg populations was sufficient to transfer protection from infected donor mice to uninfected recipients. Our results thus provide experimental evidence for a beneficial effect of H. pylori colonization on the development of allergen-induced asthma. Citation Information: J Clin Invest. 2011;121(8):3094-3099. https://doi.org/10.1172/JCI46380. Citation Information: J Clin Invest. 2011;121(8):3100-3108. https://doi.org/10.1172/JCI43656. Tumor microenvironments feature immune inhibitory mechanisms that prevent T cells from generating effective antitumor immune responses. Therapeutic interventions aimed at disrupting these inhibitory mechanisms have been shown to enhance antitumor immunity, but they lack direct cytotoxic effects. Here, we investigated the effect of cytotoxic cancer chemotherapeutics on immune inhibitory pathways. We observed that exposure to platinum-based chemotherapeutics markedly reduced expression of the T cell inhibitory molecule programmed death receptor-ligand 2 (PD-L2) on both human DCs and human tumor cells. Downregulation of PD-L2 resulted in enhanced antigen-specific proliferation and Th1 cytokine secretion as well as enhanced recognition of tumor cells by T cells. Further analysis revealed that STAT6 controlled downregulation of PD-L2. Consistent with these data, patients with STAT6-expressing head and neck cancer displayed enhanced recurrence-free survival upon treatment with cisplatin-based chemoradiation compared with patients with STAT6-negative tumors, demonstrating the clinical relevance of platinum-induced STAT6 modulation. We therefore conclude that platinum-based anticancer drugs can enhance the immunostimulatory potential of DCs and decrease the immunosuppressive capability of tumor cells. This dual action of platinum compounds may extend their therapeutic application in cancer patients and provides a rationale for their use in combination with immunostimulatory compounds. Citation Information: J Clin Invest. 2011;121(8):3109-3119. https://doi.org/10.1172/JCI57834. During seasonal influenza epidemics, disease burden is shouldered predominantly by the very young and the elderly. Elderly individuals are particularly affected, in part because vaccine efficacy wanes with age. This has been linked to a reduced ability to induce a robust serum antibody response. Here, we show that this is due to reduced quantities of vaccine-specific antibodies, rather than a lack of antibody avidity or affinity. We measured levels of vaccine-specific plasmablasts by ELISPOT 1 week after immunization of young and elderly adults with inactivated seasonal influenza vaccine. Plasmablast-derived polyclonal antibodies (PPAbs) were generated from bulk-cultured B cells, while recombinant monoclonal antibodies (re-mAbs) were produced from single plasmablasts. The frequency of vaccine-specific plasmablasts and the concentration of PPAbs were lower in the elderly than in young adults, whereas the yields of secreted IgG per plasmablast were not different. Differences were not detected in the overall vaccine-specific avidity or affinity of PPAbs and re-mAbs between the 2 age groups. In contrast, reactivity of the antibodies induced by the inactivated seasonal influenza vaccine toward the 2009 pandemic H1N1 virus, which was not present in the vaccine, was higher in the elderly than in the young. These results indicate that the inferior antibody response to influenza vaccination in the elderly is primarily due to reduced quantities of vaccine-specific antibodies. They also suggest that exposure history affects the cross-reactivity of vaccination-induced antibodies. Citation Information: J Clin Invest. 2011;121(8):3120-3132. https://doi.org/10.1172/JCI44945. Citation Information: J Clin Invest. 2011;121(8):3133-3143. https://doi.org/10.1172/JCI43598. Asthma is considered a Th2 cell–associated disorder. Despite this, both the Th1 cell–associated cytokine IFN-γ and airway neutrophilia have been implicated in severe asthma. To investigate the relative contributions of different immune system components to the pathogenesis of asthma, we previously developed a model that exhibits several features of severe asthma in humans, including airway neutrophilia and increased lung IFN-γ. In the present studies, we tested the hypothesis that IFN-γ regulates mast cell function in our model of chronic asthma. Engraftment of mast cell–deficient KitW-sh/W-sh mice, which develop markedly attenuated features of disease, with wild-type mast cells restored disease pathology in this model of chronic asthma. However, disease pathology was not fully restored by engraftment with either IFN-γ receptor 1–null (Ifngr1–/–) or Fcε receptor 1γ–null (Fcer1g–/–) mast cells. Additional analysis, including gene array studies, showed that mast cell expression of IFN-γR contributed to the development of many FcεRIγ-dependent and some FcεRIγ-independent features of disease in our model, including airway hyperresponsiveness, neutrophilic and eosinophilic inflammation, airway remodeling, and lung expression of several cytokines, chemokines, and markers of an alternatively activated macrophage response. These findings identify a previously unsuspected IFN-γ/mast cell axis in the pathology of chronic allergic inflammation of the airways in mice. Citation Information: J Clin Invest. 2011;121(8):3144-3158. https://doi.org/10.1172/JCI41857. In cystic fibrosis (CF), a lack of functional CF transmembrane conductance regulator (CFTR) chloride channels causes defective secretion by submucosal glands (SMGs), leading to persistent bacterial infection that damages airways and necessitates tissue repair. SMGs are also important niches for slow-cycling progenitor cells (SCPCs) in the proximal airways, which may be involved in disease-related airway repair. Here, we report that calcitonin gene–related peptide (CGRP) activates CFTR-dependent SMG secretions and that this signaling pathway is hyperactivated in CF human, pig, ferret, and mouse SMGs. Since CGRP-expressing neuroendocrine cells reside in bronchiolar SCPC niches, we hypothesized that the glandular SCPC niche may be dysfunctional in CF. Consistent with this hypothesis, CFTR-deficient mice failed to maintain glandular SCPCs following airway injury. In wild-type mice, CGRP levels increased following airway injury and functioned as an injury-induced mitogen that stimulated SMG progenitor cell proliferation in vivo and altered the proliferative potential of airway progenitors in vitro. Components of the receptor for CGRP (RAMP1 and CLR) were expressed in a very small subset of SCPCs, suggesting that CGRP indirectly stimulates SCPC proliferation in a non-cell-autonomous manner. These findings demonstrate that CGRP-dependent pathways for CFTR activation are abnormally upregulated in CF SMGs and that this sustained mitogenic signal alters properties of the SMG progenitor cell niche in CF airways. This discovery may have important implications for injury/repair mechanisms in the CF airway. Citation Information: J Clin Invest. 2011;121(8):3159-3175. https://doi.org/10.1172/JCI45967. Hepatocellular carcinoma (HCC) is the fifth most common cancer worldwide. It is more prevalent in men than women. Related to this, recent genetic studies have revealed a causal role for androgen receptor (AR) in hepatocarcinogenesis, but the underlying molecular mechanism remains unclear. Here, we used genome-wide location and functional analyses to identify a critical mediator of AR signaling — cell cycle–related kinase (CCRK) — that drives hepatocarcinogenesis via a signaling pathway dependent on β-catenin and T cell factor (TCF). Ligand-bound AR activated CCRK transcription and protein expression via direct binding to the androgen-responsive element of the CCRK promoter in human HCC cell lines. In vitro analyses showed that CCRK was critical in human cell lines for AR-induced cell cycle progression, hepatocellular proliferation, and malignant transformation. Ectopic expression of CCRK in immortalized human liver cells activated β-catenin/TCF signaling to stimulate cell cycle progression and to induce tumor formation, as shown in both xenograft and orthotopic models. Conversely, knockdown of CCRK decreased HCC cell growth, and this could be rescued by constitutively active β-catenin or TCF. In primary human HCC tissue samples, AR, CCRK, and β-catenin were concordantly overexpressed in the tumor cells. Furthermore, CCRK overexpression correlated with the tumor staging and poor overall survival of patients. Our results reveal a direct AR transcriptional target, CCRK, that promotes hepatocarcinogenesis through the upregulation of β-catenin/TCF signaling. Citation Information: J Clin Invest. 2011;121(8):3176-3188. https://doi.org/10.1172/JCI41695. Metastatic breast cancer is the major cause of cancer-related death among women in the Western world. Invasive carcinoma cells are able to counteract apoptotic signals in the absence of anchorage, enabling cell survival during invasion and dissemination. Although loss of E-cadherin is a cardinal event in the development and progression of invasive lobular carcinoma (ILC), little is known about the underlying mechanisms that govern these processes. Using a mouse model of human ILC, we show here that cytosolic p120-catenin (p120) regulates tumor growth upon loss of E-cadherin through the induction of anoikis resistance. p120 conferred anchorage independence by indirect activation of Rho/Rock signaling through interaction and inhibition of myosin phosphatase Rho–interacting protein (Mrip), an antagonist of Rho/Rock function. Consistent with these data, primary human ILC samples expressed hallmarks of active Rock signaling, and Rock controlled the anoikis resistance of human ILC cells. Thus, we have linked loss of E-cadherin — an initiating event in ILC development — to Rho/Rock-mediated control of anchorage-independent survival. Because activation of Rho and Rock are strongly linked to cancer progression and are susceptible to pharmacological inhibition, these insights may have clinical implications for the development of tailor-made intervention strategies to better treat invasive and metastatic lobular breast cancer. Citation Information: J Clin Invest. 2011;121(8):3189-3205. https://doi.org/10.1172/JCI42975. Metastasis is a predominant cause of death in patients with cancer. It is a complex multistep process that needs to be better understood if we are to develop new approaches to managing tumor metastasis. Tumor cell invasion of the local stroma is suppressed by collapsin response mediator protein-1 (CRMP-1). Recently, we identified a long isoform of CRMP-1 (LCRMP-1), expression of which correlates with cancer cell invasiveness and poor clinical outcome in patients with non-small-cell lung cancer (NSCLC). Here, we report that LCRMP-1 overexpression in noninvasive human cell lines enhanced filopodia formation, cancer cell migration, and invasion via stabilization of actin. This effect required a highly conserved N-terminal region of LCRMP-1 as well as the WASP family verprolin-homologous protein-1/actin nucleation pathway (WAVE-1/actin nucleation pathway). Furthermore, LCRMP-1 appeared to act downstream of Cdc42, a Rho family protein known to be involved in actin rearrangement. In addition, LCRMP-1 associated with CRMP-1, which downregulated cancer cell metastasis by interrupting the association of LCRMP-1 and WAVE-1. Finally, we found that high-level expression of LCRMP-1 and low-level expression of CRMP-1 were associated with lymph node metastasis and poor survival in patients with NSCLC. In sum, we show that LCRMP-1 and CRMP-1 have opposing functions in regulating cancer cell invasion and metastasis and propose that this pathway may serve as a potential anticancer target. Citation Information: J Clin Invest. 2011;121(8):3206-3219. https://doi.org/10.1172/JCI45273. Accumulating evidence suggests that mesenchymal stem cells (MSCs) are recruited to the tumor microenvironment; however, controversy exists regarding their role in solid tumors. In this study, we identified and confirmed the presence of carcinoma-associated MSCs (CA-MSCs) in the majority of human ovarian tumor samples that we analyzed. These CA-MSCs had a normal morphologic appearance, a normal karyotype, and were nontumorigenic. CA-MSCs were multipotent with capacity for differentiating into adipose, cartilage, and bone. When combined with tumor cells in vivo, CA-MSCs promoted tumor growth more effectively than did control MSCs. In vitro and in vivo studies suggested that CA-MSCs promoted tumor growth by increasing the number of cancer stem cells. Although CA-MSCs expressed traditional MSCs markers, they had an expression profile distinct from that of MSCs from healthy individuals, including increased expression of BMP2, BMP4, and BMP6. Importantly, BMP2 treatment in vitro mimicked the effects of CA-MSCs on cancer stem cells, while inhibiting BMP signaling in vitro and in vivo partly abrogated MSC-promoted tumor growth. Taken together, our data suggest that MSCs in the ovarian tumor microenvironment have an expression profile that promotes tumorigenesis and that BMP inhibition may be an effective therapeutic approach for ovarian cancer. Citation Information: J Clin Invest. 2011;121(8):3220-3232. https://doi.org/10.1172/JCI41514. The nuclear receptor pregnane X receptor (PXR) is activated by a range of xenochemicals, including chemotherapeutic drugs, and has been suggested to play a role in the development of tumor cell resistance to anticancer drugs. PXR also has been implicated as a regulator of the growth and apoptosis of colon tumors. Here, we have used a xenograft model of colon cancer to define a molecular mechanism that might underlie PXR-driven colon tumor growth and malignancy. Activation of PXR was found to be sufficient to enhance the neoplastic characteristics, including cell growth, invasion, and metastasis, of both human colon tumor cell lines and primary human colon cancer tissue xenografted into immunodeficient mice. Furthermore, we were able to show that this PXR-mediated phenotype required FGF19 signaling. PXR bound to the FGF19 promoter in both human colon tumor cells and “normal” intestinal crypt cells. However, while both cell types proliferated in response to PXR ligands, the FGF19 promoter was activated by PXR only in cancer cells. Taken together, these data indicate that colon cancer growth in the presence of a specific PXR ligand results from tumor-specific induction of FGF19. These observations may lead to improved therapeutic regimens for colon carcinomas. Citation Information: J Clin Invest. 2011;121(8):3233-3243. https://doi.org/10.1172/JCI43124. Hypertension is a leading contributor to cardiovascular mortality worldwide. Despite this, its underlying mechanism(s) and the role of excess salt in cardiorenal dysfunction are unclear. Previously, we have identified cross-talk between mineralocorticoid receptor (MR), a nuclear transcription factor regulated by the steroid aldosterone, and the small GTPase Rac1, which is implicated in proteinuric kidney disease. We here show that high-salt loading activates Rac1 in the kidneys in rodent models of salt-sensitive hypertension, leading to blood pressure elevation and renal injury via an MR-dependent pathway. We found that a high-salt diet caused renal Rac1 upregulation in salt-sensitive Dahl (Dahl-S) rats and downregulation in salt-insensitive Dahl (Dahl-R) rats. Despite a reduction of serum aldosterone levels, salt-loaded Dahl-S rats showed increased MR signaling in the kidneys, and Rac1 inhibition prevented hypertension and renal damage with MR repression. We further demonstrated in aldosterone-infused rats as well as adrenalectomized Dahl-S rats with aldosterone supplementation that salt-induced Rac1 and aldosterone acted interdependently to cause MR overactivity and hypertension. Finally, we confirmed the key role of Rac1 in modulating salt susceptibility in mice lacking Rho GDP–dissociation inhibitor α. Therefore, our data identify Rac1 as a determinant of salt sensitivity and provide insights into the mechanism of salt-induced hypertension and kidney injury. Citation Information: J Clin Invest. 2011;121(8):3244-3257. https://doi.org/10.1172/JCI45843. A fine balance between bone resorption by osteoclasts and bone formation by osteoblasts maintains bone homeostasis. In patients with cherubism, gain-of-function mutations in 3BP2, which is encoded by SH3-domain binding protein 2 (SH3BP2), cause cystic lesions with activated osteoclasts that lead to craniofacial abnormalities. However, little is known about the function of wild-type 3BP2 in regulating bone homeostasis. Here we have shown that 3BP2 is required for the normal function of both osteoblasts and osteoclasts. Initial analysis showed that Sh3bp2–/–mice developed osteoporosis as a result of reduced bone formation despite the fact that bone resorption was impaired. We demonstrated using reciprocal bone marrow chimeras, a cell-intrinsic defect of the osteoblast and osteoclast compartments in vivo. Further, Sh3bp2–/– osteoblasts failed to mature and form mineralized nodules in vitro, while Sh3bp2–/– osteoclasts spread poorly and were unable to effectively degrade dentine matrix in vitro. Finally, we showed that 3BP2 was required for Abl activation in osteoblasts and Src activation in osteoclasts, and demonstrated that the in vitro defect of each cell type was restored by the respective expression of activated forms of these kinases. These findings reveal an unanticipated role for the 3BP2 adapter protein in osteoblast function and in coordinating bone homeostatic signals in both osteoclast and osteoblast lineages. Citation Information: J Clin Invest. 2011;121(8):3258-3268. https://doi.org/10.1172/JCI46267. Citation Information: J Clin Invest. 2011;121(8):3269-3276. https://doi.org/10.1172/JCI44371. The small GTPase RhoA serves as a nodal point for signaling through hormones and mechanical stretch. However, the role of RhoA signaling in cardiac pathophysiology is poorly understood. To address this issue, we generated mice with cardiomyocyte-specific conditional expression of low levels of activated RhoA (CA-RhoA mice) and demonstrated that they exhibited no overt cardiomyopathy. When challenged by in vivo or ex vivo ischemia/reperfusion (I/R), however, the CA-RhoA mice exhibited strikingly increased tolerance to injury, which was manifest as reduced myocardial lactate dehydrogenase (LDH) release and infarct size and improved contractile function. PKD was robustly activated in CA-RhoA hearts. The cardioprotection afforded by RhoA was reversed by PKD inhibition. The hypothesis that activated RhoA and PKD serve protective physiological functions during I/R was supported by several lines of evidence. In WT mice, both RhoA and PKD were rapidly activated during I/R, and blocking PKD augmented I/R injury. In addition, cardiac-specific RhoA-knockout mice showed reduced PKD activation after I/R and strikingly decreased tolerance to I/R injury, as shown by increased infarct size and LDH release. Collectively, our findings provide strong support for the concept that RhoA signaling in adult cardiomyocytes promotes survival. They also reveal unexpected roles for PKD as a downstream mediator of RhoA and in cardioprotection against I/R. Citation Information: J Clin Invest. 2011;121(8):3277-3288. https://doi.org/10.1172/JCI57833. Sinus node dysfunction (SND) is a major public health problem that is associated with sudden cardiac death and requires surgical implantation of artificial pacemakers. However, little is known about the molecular and cellular mechanisms that cause SND. Most SND occurs in the setting of heart failure and hypertension, conditions that are marked by elevated circulating angiotensin II (Ang II) and increased oxidant stress. Here, we show that oxidized calmodulin kinase II (ox-CaMKII) is a biomarker for SND in patients and dogs and a disease determinant in mice. In wild-type mice, Ang II infusion caused sinoatrial nodal (SAN) cell oxidation by activating NADPH oxidase, leading to increased ox-CaMKII, SAN cell apoptosis, and SND. p47–/– mice lacking functional NADPH oxidase and mice with myocardial or SAN-targeted CaMKII inhibition were highly resistant to SAN apoptosis and SND, suggesting that ox-CaMKII–triggered SAN cell death contributed to SND. We developed a computational model of the sinoatrial node that showed that a loss of SAN cells below a critical threshold caused SND by preventing normal impulse formation and propagation. These data provide novel molecular and mechanistic information to understand SND and suggest that targeted CaMKII inhibition may be useful for preventing SND in high-risk patients. Citation Information: J Clin Invest. 2011;121(8):3289-3305. https://doi.org/10.1172/JCI46482. An increase in neuronal burst activities in the subthalamic nucleus (STN) is a well-documented electrophysiological feature of Parkinson disease (PD). However, the causal relationship between subthalamic bursts and PD symptoms and the ionic mechanisms underlying the bursts remain to be established. Here, we have shown that T-type Ca2+ channels are necessary for subthalamic burst firing and that pharmacological blockade of T-type Ca2+ channels reduces motor deficits in a rat model of PD. Ni2+, mibefradil, NNC 55-0396, and efonidipine, which inhibited T-type Ca2+ currents in acutely dissociated STN neurons, but not Cd2+ and nifedipine, which preferentially inhibited L-type or the other non–T-type Ca2+ currents, effectively diminished burst activity in STN slices. Topical administration of inhibitors of T-type Ca2+ channels decreased in vivo STN burst activity and dramatically reduced the locomotor deficits in a rat model of PD. Cd2+ and nifedipine showed no such electrophysiological and behavioral effects. While low-frequency deep brain stimulation (DBS) has been considered ineffective in PD, we found that lengthening the duration of the low-frequency depolarizing pulse effectively improved behavioral measures of locomotion in the rat model of PD, presumably by decreasing the availability of T-type Ca2+ channels. We therefore conclude that modulation of subthalamic T-type Ca2+ currents and consequent burst discharges may provide new strategies for the treatment of PD. Citation Information: J Clin Invest. 2011;121(8):3306-3319. https://doi.org/10.1172/JCI57413. Huntington disease (HD) is a devastating neurodegenerative disorder for which there are no disease-modifying treatments. Previous studies have proposed that activation of the heat shock response (HSR) via the transcription factor heat shock factor 1 (HSF1) may be of therapeutic benefit. However, the effect of disease progression on the HSR and the therapeutic potential of this pathway are currently unknown. Here, we used a brain-penetrating HSP90 inhibitor and physiological, molecular, and behavioral readouts to demonstrate that pharmacological activation of HSF1 improves huntingtin aggregate load, motor performance, and other HD-related phenotypes in the R6/2 mouse model of HD. However, the beneficial effects of this treatment were transient and diminished with disease progression. Molecular analyses to understand the transient nature of these effects revealed altered chromatin architecture, reduced HSF1 binding, and impaired HSR accompanied disease progression in both the R6/2 transgenic and HdhQ150 knockin mouse models of HD. Taken together, our findings reveal that the HSR, a major inducible regulator of protein homeostasis and longevity, is disrupted in HD. Consequently, pharmacological induction of HSF1 as a therapeutic approach to HD is more complex than was previously anticipated. Citation Information: J Clin Invest. 2011;121(8):3320-3330. https://doi.org/10.1172/JCI45803. Several neurodegenerative disorders, including Parkinson disease (PD), are characterized by the presence of Lewy bodies — cytoplasmic inclusions containing α-synuclein protein aggregates — in the affected neurons. A poorly understood feature of Lewy body diseases is loss of sympathetic nerves in the heart and other organs, manifesting as orthostatic hypotension (OH; also known as postural hypotension). We asked whether sympathetic denervation is associated with decreased uptake of catecholamines, such as dopamine and norepinephrine, into storage vesicles within sympathetic neurons. We used 6-[18F]-dopamine (18F-DA) to track myocardial uptake and retention of catecholamines. Concurrently, the fate of intra-neuronal 18F-DA was followed by assessment of arterial plasma levels of the 18F-DA metabolite 18F-dihydroxyphenylacetic acid (18F-DOPAC). The ratio of myocardial 18F-DA to arterial 18F-DOPAC provided an index of vesicular uptake. Tracer concentrations were measured in patients with PD with or without orthostatic hypotension (PD+OH, PD-No-OH); in patients with pure autonomic failure (PAF, a Lewy body disease without parkinsonism); in patients with multiple system atrophy (MSA, a non–Lewy body synucleinopathy); and in normal controls. Patients with PD+OH or PAF had decreased vesicular 18F-DA uptake and accelerated 18F-DA loss, compared with MSA and control subjects. PD-No-OH patients could be subtyped into one of these categories based on their initial 18F-DA uptake. We conclude that sympathetic denervation in Lewy body diseases is associated with decreased vesicular uptake of neuronal catecholamines, suggesting that vesicular monoamine transport is impaired. Vesicular uptake may constitute a novel target for diagnosis, treatment, and prevention. Citation Information: J Clin Invest. 2011;121(8):3331-3342. https://doi.org/10.1172/JCI44564. The failure of pancreatic β cells to adapt to an increasing demand for insulin is the major mechanism by which patients progress from insulin resistance to type 2 diabetes (T2D) and is thought to be related to dysfunctional lipid homeostasis within those cells. In multiple animal models of diabetes, females demonstrate relative protection from β cell failure. We previously found that the hormone 17β-estradiol (E2) in part mediates this benefit. Here, we show that treating male Zucker diabetic fatty (ZDF) rats with E2 suppressed synthesis and accumulation of fatty acids and glycerolipids in islets and protected against β cell failure. The antilipogenic actions of E2 were recapitulated by pharmacological activation of estrogen receptor α (ERα) or ERβ in a rat β cell line and in cultured ZDF rat, mouse, and human islets. Pancreas-specific null deletion of ERα in mice (PERα–/–) prevented reduction of lipid synthesis by E2 via a direct action in islets, and PERα–/– mice were predisposed to islet lipid accumulation and β cell dysfunction in response to feeding with a high-fat diet. ER activation inhibited β cell lipid synthesis by suppressing the expression (and activity) of fatty acid synthase via a nonclassical pathway dependent on activated Stat3. Accordingly, pancreas-specific deletion of Stat3 in mice curtailed ER-mediated suppression of lipid synthesis. These data suggest that extranuclear ERs may be promising therapeutic targets to prevent β cell failure in T2D. Citation Information: J Clin Invest. 2011;121(8):3343-3356. https://doi.org/10.1172/JCI44957. The tumor suppressor p53 has been implicated in the pathogenesis of non-cancer-related conditions such as insulin resistance, cardiac failure, and early aging. In addition, accumulation of p53 has been observed in the hepatocytes of individuals with fibrotic liver diseases, but the significance of this is not known. Herein, we have mechanistically linked p53 activation in hepatocytes to liver fibrosis. Hepatocyte-specific deletion in mice of the gene encoding Mdm2, a protein that promotes p53 degradation, led to hepatocyte synthesis of connective tissue growth factor (CTGF; the hepatic fibrogenic master switch), increased hepatocyte apoptosis, and spontaneous liver fibrosis; concurrent removal of p53 completely abolished this phenotype. Compared with wild-type controls, mice with hepatocyte-specific p53 deletion exhibited similar levels of hepatocyte apoptosis but decreased liver fibrosis and hepatic CTGF expression in two models of liver fibrosis. The clinical significance of these data was highlighted by two observations. First, p53 upregulated CTGF in a human hepatocellular carcinoma cell line by repressing miR-17-92. Second, human liver samples showed a correlation between CTGF and p53-regulated gene expression, which were both increased in fibrotic livers. This study reveals that p53 induces CTGF expression and promotes liver fibrosis, suggesting that the p53/CTGF pathway may be a therapeutic target in the treatment of liver fibrosis. Citation Information: J Clin Invest. 2011;121(8):3357-3359. https://doi.org/10.1172/JCI59686. Citation Information: J Clin Invest. 2011;121(8):3360-3360. https://doi.org/10.1172/JCI59854. Citation Information: J Clin Invest. 2011;121(8):3360-3360. https://doi.org/10.1172/JCI59981.